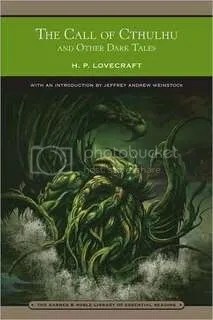 This week I chose to read “The Call of Cthulhu” by H. P. Lovecraft for Short Stories on Wednesdays, hosted by Breadcrumb Reads. 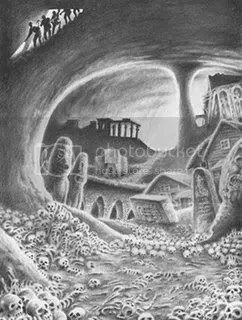 I had been working my way through a collection of Lovecraft’s stories during the R.I.P. Challenge, but hadn’t gotten as far as the Cthulhu mythos yet. 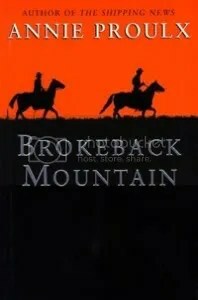 As this is one of his most famous, I decided to skip ahead and read it now. The story is comprised of the notes of a man named Thurston, who has pieced together papers from his granduncle to tell the story of Cthulhu. The first segment deals with a bas-relief sculpture of a strange creature. The sculptor was one of many unrelated individuals who reported having strange dreams of an ancient city with alien geometry and a winged squid monstrosity. The second segment describes a cult near New Orleans, where a similar statue was found. Thurston pieces together the beliefs of the cult, which holds that the Great Old Ones dwelled on Earth in the past, but now sleep in a sunken city. One day they shall awaken and begin a reign of destruction. Lovecraft is only a little bit racist in “The Call of Cthulhu,” which is more than I can say about many of his other works. I can see why people like this story so much. The existence of the Great Old Ones is just plausible enough to send chills down one’s spine, especially considering the fact that different cultures around the world with no connection to each other often have similar mythologies. It’s interesting to imagine, especially since I’ve been told that Cthulhu is supposed to be only among the lesser of the Great Old Ones. I’ve got a great respect for Lovecraft for coming up with such a compelling concept. I recommend Lovecraft as bedtime reading. His stories make excellent nightmare fuel. 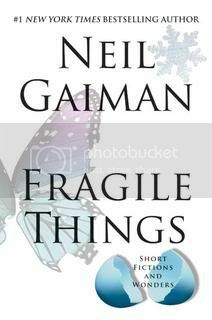 This week concludes the groupread of Neil Gaiman’s collection of short stories entitled “Fragile Things,” hosted by Carl from Stainless Steel Droppings as a part of the R.eaders I.mbibing P.eril Challenge. 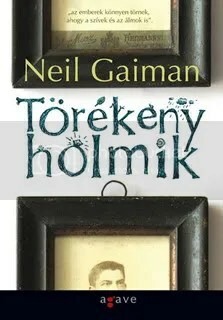 The image to the left is the cover from the Hungarian version of the book. 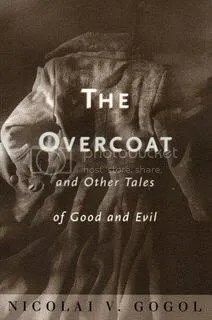 I thought it was interesting to see the various international covers from the book, as they each provided different ways of interpreting the atmosphere of the collection. 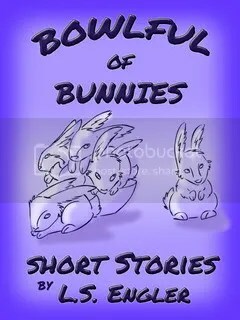 Today’s post will involve spoilers from the last four stories/poems in the book. Later in the week, I’ll be posting a spoiler-free review of the book as a whole for anyone who hasn’t been following along. I loved the opening lines of the poem. I’m sure part of it has to do with the first snow flurries of the season that fell in DC yesterday. Poor narrator’s a wee bit narcissistic, isn’t he? I liked this one. The imagery was nice, and who doesn’t love the zombie apocalypse? As I’ve said many times before, I love Neil Gaiman’s poems. He did such a good job setting the tone of this one… imagining Scheherazade trying to come up with stories and finding inspiration from ordinary events in her day-to-day life. Unlike the rest of us, she really couldn’t afford to get the occasional writer’s block when telling new stories. I liked the contrast that Gaiman draws between the very ordinary routine and her extraordinary circumstances. This poem was quite well done. Earlier in the book, we were introduced to Smith and Mr. Alice, and most of us tended to agree that the duo deserved to die (or worse) for their actions. In this book, they weren’t so dark, and in fact almost seemed likeable. Of all the characters in the story, I thought that Jennie was the most interesting. I felt bad that she and Shadow couldn’t be together in the end. They’d have made a rather cute couple. I also enjoyed the fact that Shadow seemed to have only a vague understanding of his past, revealed to us only through nightmares and bits of legend. He didn’t seem to understand his place within legend until it was too late to turn back. “Sunbird” and “The Monarch of the Glen” both interested me in part because they told stories that were very cyclical; the same events happened throughout the centuries, but our characters didn’t understand until after the fact that they were becoming a part of the very same pattern. I loved the poems this week. Overall, these selections were a great way to conclude the readalong. It seems to have gone by so quickly, even though we’ve been doing this for eight weeks now!